It was a dream series for Virat Kohli who scored 558 runs out of the 2522 runs from the bat in this series that translates Kohli’s runs into 22% of the series. His series tally couldn’t be surpassed by the cumulative of the next two highest run-getters in the series Shikhar Dhawan (323) and Rohit Sharma (170) shows the dominance of the Indian captain. 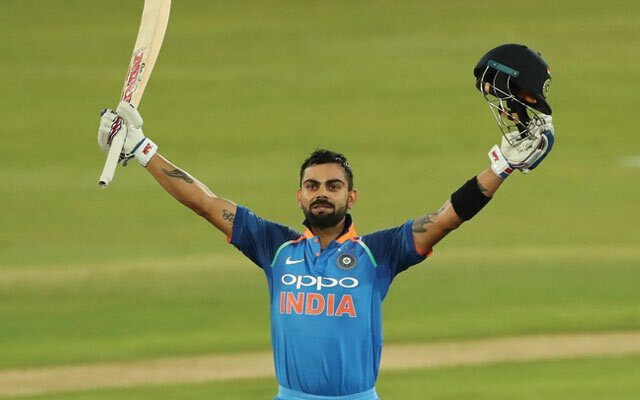 The fact that Kohli didn’t have an ODI hundred in South Africa before this tour makes his achievement even more special as the 29-year-old ended his drought with three tons. Kohli won man of the match awards in the three games he scored centuries. He showed consistency throughout the series as his lowest score in this 6-match series came in the 5th game where he made 36 runs before getting runout. He remained unbeaten on 46 in the 2nd ODI during the small run-chase and made “only” 75 in the 4th match which was the only match India lost in the series, a game that was affected by the rain. By the 558 runs, Virat Kohli also became the first player in ODI history to score 500 runs in a bilateral series. Pakistan’s Zaheer Abbas was the first to aggregate 300 runs in a bilateral ODI series when he scored 346 runs against India in 1982. Desmond Haynes became the first to score 400 runs when he aggregated 404 runs against New Zealand in 1985 but it needed another 33 years for a player to breach the 500-run barrier. 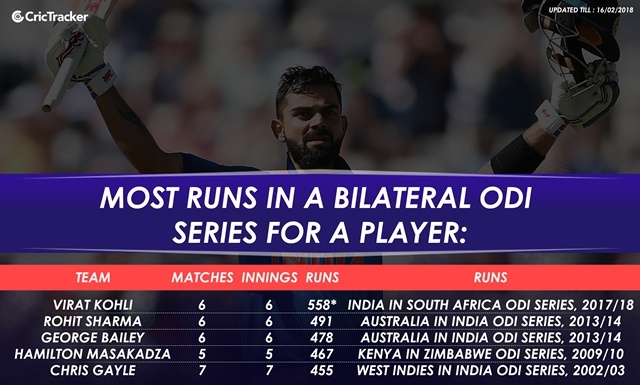 On his way to 500, Kohli went past Rohit Sharma’s 491 runs (vs Australia in 2013) which were the previous most by any player in a bilateral ODI series. Kohli is only the 2nd to Sachin Tendulkar in scoring 500 runs for India in an ODI series/tournament. The former Indian cricketer scored a record 673 runs during the 2003 World Cup and 523 runs in the 1996 edition of the World Cup. Kohli also became the first Indian to score three hundreds in a bilateral ODI series and the 3rd with three tons in an ODI series/tournament. Sourav Ganguly in the 2003 CWC and VVS Laxman in the 2004 VB series in Australia also hit three hundreds each for India.